When New England Soundproofing got a call from the Great Dog Rescue NE, they were in dire need of soundproofing due to the loud noise within the facility. The landlord for the Great Dog Rescue had threatened to evict them if they couldn’t fix the noise issue. If evicted, owners would have to shut down the business, putting hundreds of dogs back onto the street. 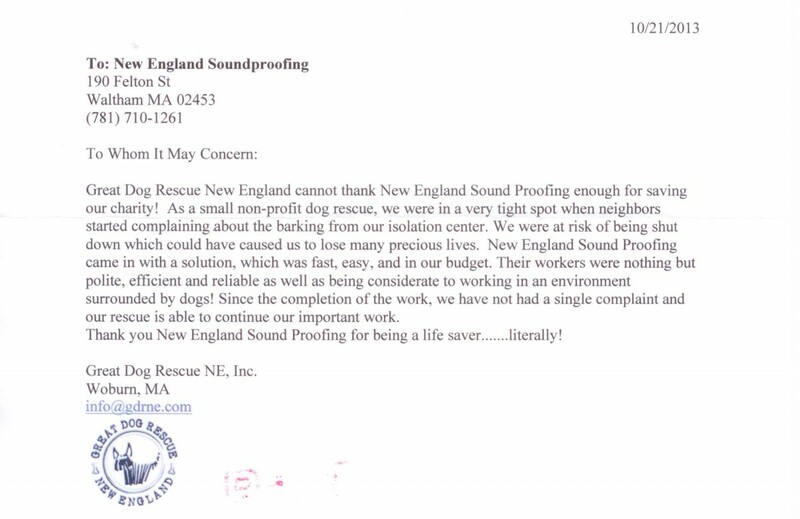 Great Dog Rescue called New England Soundproofing for a soundproofing solution, hoping to save all of the dog's lives. After an on-site consultation, it was obvious that the loud barking in the big open concrete section would reverberate within the building. This would put pressure on the wall that divides them from the landlord's office space. The owner of Great Dog Rescue had previously tried using soundproofing materials that they purchased online, but installed them improperly, so the difference was minimal. In ordering the right materials from an online store, but being unfamiliar with how they work or how to install them, the materials failed to reduce the noise. New England Soundproofing stepped in to properly soundproof the room, and help with the reverberation. When New England Soundproofing went there, the dividing wall had sheetrock and MLV, with no insulation between them. New England Soundproofing built another wall in front of the current wall. This wall did not touch the existing wall, and we built with metal studs, 3.5’’ thick Sound Insulation, 1/8’’ MLV, and Sheetrock. New England Soundproofing also installed rubber Isolation Pads on the wall at the floor and roof deck. All seams and joints would be taped and sealed, for a complete seal. New England Soundproofing also installed 744 SF of acoustic throughout the walls of the room to reduce the reverberations. This helped reduce the pressure on the dividing walls. Months after the install, the Great Dog Rescue didn’t have to move out, shut down, or get rid of any of their dogs. The noise level had been reduced, with no more complaints, and the acoustics and barking in the room itself were dramatically reduced. Now it is a calmer, more peaceful place for the dogs to stay. 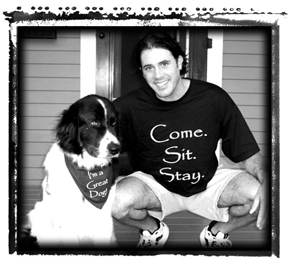 Great Dog Rescue New England is a nonprofit, all-breed rescue group headquartered in Massachusetts. The group is comprised of volunteers all over New England, who love dogs and want to help those that end up homeless through no fault of their own. If you want to help the Great Dog Rescue NE, visit there website or contact them directly at info@gdrne.com.